Welcome to campus—please park in white-lined parking spaces on pavement only. Day visitors are directed to park on North Campus Drive (off of Bath Road), South Campus Drive (off of College Street), Coffin Street Parking Lot, Dayton Lot (off of Sills Drive), and Russwurm House Parking Lot (just east of Tower Drive). All employees should register their vehicles with Campus Safety and will then be issued a dark blue decal. 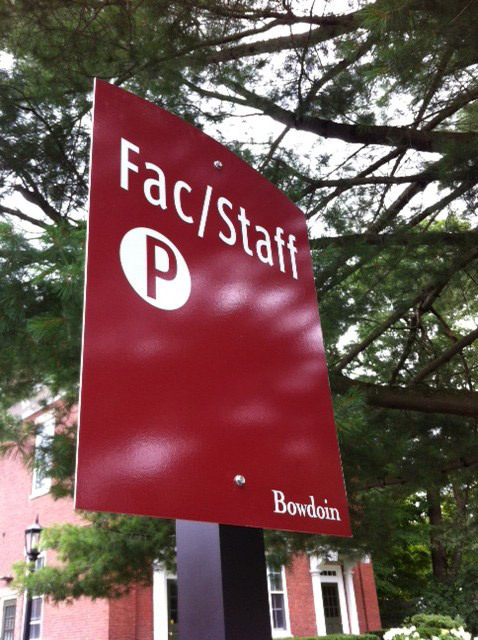 Faculty and staff may park in any employee parking lot. These include: North Campus Drive, South Campus Drive, Dayton Lot, Druckenmiller Lot, Coffin Street Lot, Farley Field House, Lancaster Lot, Stowe House Inn Upper Lot, 85 Federal Street, Rhodes Hall, 85 Union Street, Ashby House, the Maine Street College House lots (Howell, Burnett, Helmreich, MacMillan, and Quinby), and several other designated employee parking areas. 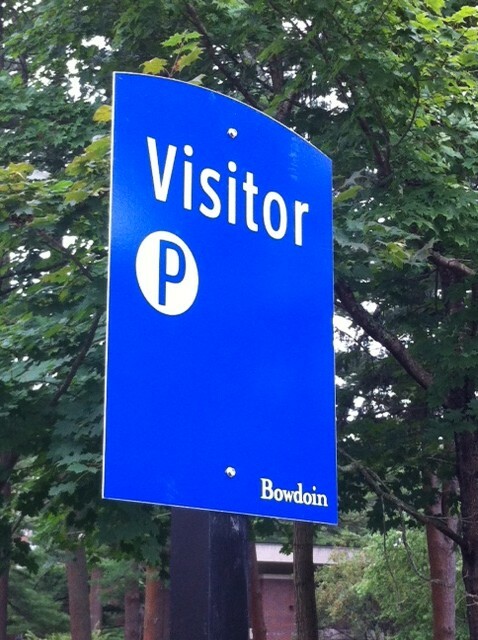 Vendors, contractors, and other long-term visitors staying more than one day must obtain a dated temporary parking permit to park on campus. Regular visitors to campus must also obtain a temporary parking permit that will be valid for an extended period of time. Temporary parking permits are available at the Communications Center located at Rhodes Hall, 9 Bath Road, and must be displayed on the dashboard or mirror. Park Row: Overnight parking (1 a.m.–6 a.m.) is prohibited from Longfellow Avenue north to the Chamberlain Statue. There is a two-hour parking limit from 8 a.m.–6 p.m. from Gustafson House north to the intersection of College Street, and in several spaces in front of the Museum of Art. Parking is not permitted in the yellow-striped section in front of Searles Science Building. Maine Street: Overnight parking (1a.m.–6 a.m.) is prohibited. Potter Street: Overnight parking (1 a.m.–6 a.m.) is prohibited. South Street: Overnight parking (1 a.m.–6 a.m.) is prohibited. Page Street: Overnight parking (1 a.m.–6 a.m.) is prohibited without a street resident permit. Longfellow Avenue: Overnight parking (1 a.m.–6 a.m.) is prohibited without a street resident permit. Cleaveland Street: Restricted to two-hour parking (8 a.m.–6 p.m.).